Oh, how I wish that this were an April Fools’ joke. 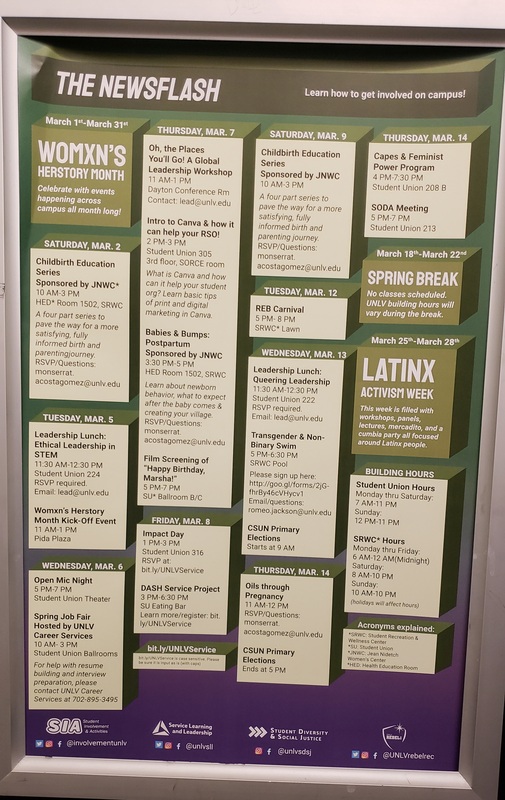 Below is a picture of the newsflash from the University of Nevada, Las Vegas for the month of March. Can you see anything wrong with it? The following article is a satirical take on the way that modern scholars write about medieval and ancient history. Across the country millions of classics-aficionados will be celebrating the 1,234th anniversary of US’s founding today. But although most understand that the significance of July 4th, 1776 is purely fictional, they struggle to understand just where to draw the line between fact and fable. Drawing from the most up-to-date scholarship, I will sort out the facts of US’s founding. George Washington was the mythical first president of US. Modern historians universally agree that he never existed. His first name was borrowed from the reigning English king, King George III whose existence is attested from other sources, and his last name came from the capital city of Washington DC. George Washington was created to give prestige to the city–according to American mythology the city was named after the person, whereas modern scholars are certain that the city’s name was retroactively applied to the mythical person. Several stories survive from George Washington’s life, and they all serve to affirm that he was a purely mythical figure. He was said to have had wooden teeth, and at some point during his childhood he is said to have confessed to chopping down his father’s cherry tree, saying, “I cannot tell a lie; it was I.”  As a general who fought in the War of Independence, Washington was said to have crossed the Delaware River on Christmas to launch a surprise attack on the British. Archaeologists have found no evidence of such a river crossing, and this story is obviously political propaganda that made Americans seem invincible. That perceived invincibility was bolstered further by the story of Washington and his soldiers braving the harsh, cold winter in Valley Forge. This story is not considered the least bit accurate because global warming would have made Valley Forge comfortable even in the dead of winter. The city of Washington DC was, at first, also purely mythological. Washington DC was always afforded reverence and awe throughout American mythology, and was seen as a place where great American moments happened. For example, a preacher named Martin Luther King, Jr. was said to have given a famous speech in front of the National Mall to a crowd of thousands. This speech was probably made up by a Christian historian at a later date. The National Mall was set on one side by a statue of the mythical Abraham Lincoln (perhaps a confused memory of the Biblical Abraham?) and the Washington Monument on the other. The Washington Monument was an obelisk that was said to be 555 feet and 5 inches tall. This is obviously the work of a very fertile imagination! If such a monument ever existed, we can be certain that it was not to such a specification. 555’5″ makes for an entertaining story, but it is hardly a real structural measurement. Sources state that the capital of US was Washington DC, but earlier sources from before 1790 say that it was Philadelphia. Because historians recognize that older sources are generally more reliable, Philadelphia is considered to be the true capital of US for at least the first 150 years of the nation’s existence. Washington DC seems to have evolved out of an American ideal. Even before the nation’s founding, a preacher named John Winthrop wrote a poignant message called “City upon a hill” that called for Americans to practice good conduct. It is possible that this evolved into the idea of a literal city representing the best of America, and Washington DC was this realized ideal. Later on there was a real city named Washington DC and it is probable that Philadelphia was renamed to Washington DC as a political move by the president to secure support from the American people. The city of Philadelphia, Pennsylvania, is often confused for the Philadelphia that became Washington DC. The first historically attested US president was Richard Nixon, for his name appears on the Lunar Plaque which lies on the Moon. This was the result of the fabled “space race” of the Cold War. Surviving sources claim that the “space race” was the idea of the president JFK, who was assassinated in 1963. JFK was said to be assassinated by a lone sniper, but this was debunked by Oliver Stone’s film “JFK.”  Although Stone’s film has been lost, it demonstrated that JFK could not have been killed by a lone gunman, and this assessment makes more sense once we understand that JFK was not a single person. Rather JFK was an amalgam of tribal chieftains from US’s three most powerful tribes who lent their initials to the acronym: the Jacksonians for J, the Federalists for F, and the Klansmen for K. These three together composed the council of JFK. Later generations made up the name “John Fitzgerald Kennedy” and retroactively applied it to JFK, and thus he was eventually seen as a single person. After key members of JFK were assassinated in 1963, the nation was vulnerable to a power vacuum. Two of the tribes, J and F, banded together to share political power evenly amongst themselves. With the passage of the Civil Rights Act of 1965, a crushing blow was dealt to the Klansmen who then lost power. The remaining two factions then evolved into the Democrats and Republicans. The Democrats, formerly the Jacksonians, traced their lineage back to the mythical founder of the Democratic Party, Andrew Jackson. Some sources say that JFK’s successor was LBJ, but modern scholars are unsure what to make of this. The Republicans tended to revere certain leaders such as the semi-legendary president Ronald Reagan. Ronald Reagan was an actor who dabbled in politics, although there is no evidence that he ever became president. Another Republican president named Donald Trump was also an actor and prolific businessman, and it has been suggested that Ronald Reagan and Donald Trump were the same person; the names Ronald and Donald are only one letter apart, so it is possible that over the centuries their names and identities became conflated. Ronald Reagan was said to have ended the Cold War, but the events surrounding this are spurious at best. The accepted explanation for Ronald Reagan’s “Star Wars” is that differing pieces of information were blended together over the centuries. Historians have discovered a film franchise called “Star Wars,” the first installment of which was made in 1977. Because Ronald Reagan was a film actor in the late 20th century and Star Wars was a late 20th century film franchise, scholars surmise that later historians thought that either the “Star Wars” films were non-fiction or that their name applied to a real government program. Thus, although we know that Ronald Reagan was a real person, at least in name, very few details about his life or career can be stated confidently. It was not until the late 21st century that we begin to have a mostly factual history of US. Scholars may never know the true details of America’s formative early centuries, and our job is not made any easier by different dates that are floating around (don’t even get me started on the mythological 1607 founding of Jamestown!) but that doesn’t mean that we can’t celebrate the idea of US. Just please remember to separate history from pseudohistory, and fact from fiction. Listen to modern scholars. We know what we’re talking about. Romulus never existed. He was said to have been suckled by a she-wolf and because that one thing didn’t really happen, nothing in his life really happened. Romulus was named after Rome, not the other way around, because that somehow makes sense. If the person was named after the city, then why was he called “Romulus” instead of “Romus?” Don’t ask me. I’m just here to say that things are false without any evidence to back up my claims. Even though I begrudgingly admit that Troy was a real city and the Trojan War really happened, I can confidently declare that Aeneas and Ascanius never existed, and Trojans never migrated to Italy or Britain or anywhere else after the war. None of the Roman kings existed, or they were legendary. Eudaf Hen and Octavius “Eudaf Hen” can’t possibly be the same person. King Arthur never existed, and none of the British kings before him existed either. None of the kings of Kvenland existed. None of the Norse kings existed. No viking before Harald Bluetooth existed. Scandinavia simply emerged out of the sea in 900 AD fully-populated. All of the historical sources attesting to their existence are automatically pseudo-history, because I have a PhD and that makes me smarter than you. Geoffrey of Monmouth: liar. Nennius: liar. Gildas: liar. Every historian who disagrees with me: liar. Karl Marx: brilliant, accurate, insightful, a god among men. Barry Fell made a few mistakes in his work, so no one crossed the Atlantic before Christopher Columbus. I freely admit that everything that Manetho wrote is a lie, but he’s the only ancient Egyptian historian there is, so I believe him. If the Jews crossed the Sinai desert, there should still be archaeological evidence after 2,500 years despite the near-constant desert crossings by Bedouins, the treading of wild animals, and weather. If you would like to read a book that tears into modern scholars while defending the writings of Nennius and others, I highly recommend that you read After the Flood by Bill Cooper. Also, don’t watch Oliver Stone’s film. It’s full of crap, and that’s why I included it as a “reliable source” in the article. 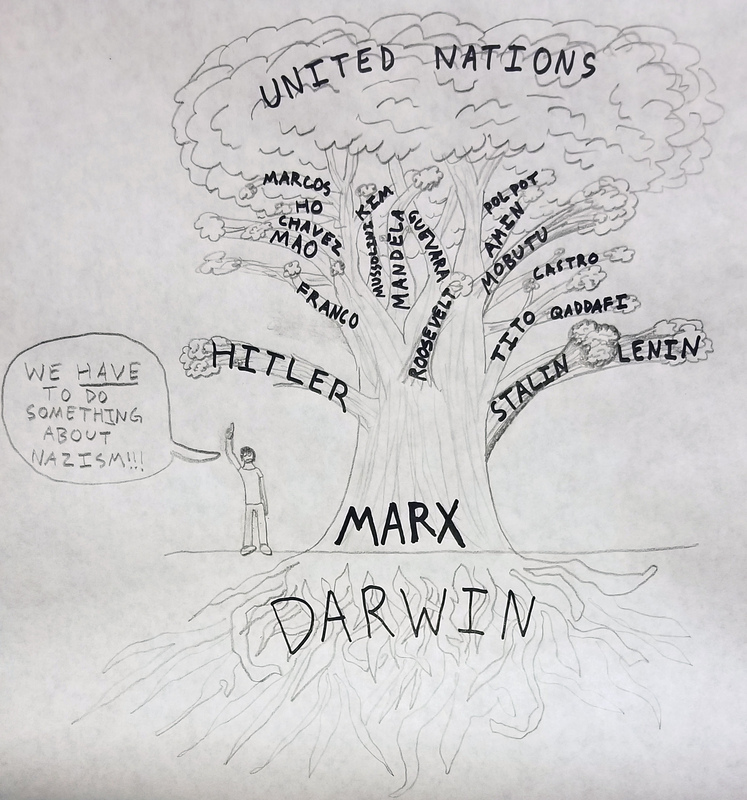 “Strike at the Root.” A political cartoon, by me. “Only white people can be racist.” This is the conclusion drawn by many activists of the modern day, who exert their various energies toward the goal of attaining justice for society. The reasoning goes that racism is prejudice plus institutionalized power, so only white persons can be racist. Let’s look at whether this is true and what it really means. Imagine that you made a bet with someone. It doesn’t matter what the bet is over–it may be the outcome of a football game or the toss of the dice. But whichever game, and for whatever reason aside, you and a rival enter into a wager. The stakes are as follows: The loser’s house will be burned to the ground. Now, assuming that you take the bet, you are aware that you are entering a wager where someone’s house will be burned down. To such a bettor, the desired outcome is a house burning down. Of course, you will surely wish that it shan’t be your house, but you will wish that a house burn down. You’ll just wish it’s the house of your rival. Notice I have said nothing of intentions or motives. Morally speaking, it does not matter why you are taking the bet. Maybe you need the winnings for emergency surgery or to make your car payment. But the reason does not matter. No matter what the outcome, someone’s property will be destroyed for the benefit of a short-term gain by the winning party. No one can deny that there are many problems facing us today. Poverty, illiteracy, corruption, and so on are enduring obstacles in our lives. Many people do their best to combat these problems, but in order to do this effectively we have to first figure out what is causing these problems. The trouble is, people can’t seem to agree on the causes of most of these issues. It seems that everyone has different answers. Depending on the person you ask, you might hear the answers: because of the poor, because of immigrants, because of rich corporations, because of lobbying, because of corrupt politicians, and so on. What I would like to discuss now, however, is an answer that hasn’t been very popular but is steadily gaining traction. There is a radical movement that puts forth the idea that government in general is the primary cause of most societal problems. Not a certain Government in particular, mind you. Not a Republican Government or a Democratic Government. Not a parliamentary or congressional Government. Just government in any of its myriad forms. Such a simplistic worldview suffers from a fundamental problem, and I want now to explain what it is. This was a diagnostic writing I did for my English composition class. I had one hour to complete it; this is the finished essay. Margaret Mead said, “Never doubt that a small group of thoughtful citizens can change the world. Indeed, it is the only thing that ever has.” However, it is hard to believe that just a few people can make a significant difference. Given the many great challenges that the world faces, it seems impossible to change anything for the better unless one can attract a lot of people and spend a lot of money. Assignment: Can a small group of concerned individuals have a significant impact on the world? Plan and write an essay in which you develop your point of view on this issue. Support your position with reasoning and examples taken from your reading, studies, experience, or observations. When dealing with the economic effects of a policy it is paramount that we are able to see the unseen. In my debate with Mr. S last week several studies on minimum wage effects were referred to but not sufficiently analyzed (my bad). Especially in regards to the Krueger & Card study, it is important to realize that economists with an agenda will make the info say what they want the info to say. For example: the gender gap! In case you haven’t heard, lately there’s been a lot of debate concerning the minimum wage. Opinions are varied but among those who are most outspoken on the matter, most want the wage to be raised to $11 per hour. Every side brings up important points, but what most human beings forget to do when debating is to let the facts dictate opinion instead of the other way around. This may bother you, and if it does I hope very much to convince you, but I believe that the minimum wage ought to be abolished. As in, a $0 minimum wage. And about 50% of economists agree on that point. If you don’t, but you’re open-minded and willing to learn, read on.